This is a nice dive to get a break from all the muck. 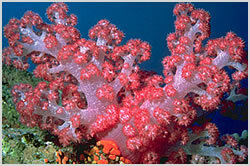 Colourful coral gardens with large orange tree corals and red gorgonians feeding in the current here. The visibility is also often better that that of the murkier muck sites. There is a plateau at around 14 meters where the critters can be found for those macro addicts that simply cant get enough!